To accompany last year’s Christmas Lectures, the Royal Insitution asked us to produce three films of amazing chemical reactions. Inspired by the old alchemical elements, the videos show dramatic examples of ‘Earth’, ‘Air’ and ‘Fire’ changing before your eyes. The Earth video shows the violent destruction of calcium oxide blocks with water, Air shows the dangerous power of nitrogen triiodide, while Fire warns of the danger of putting water on an oil fire. The three videos were featured on the Daily Mail and Guardian websites. The Voluntary Marine Reserve at St Abbs and Eyemouth asked us to produce a series of films for every Keystage 1 and 2 children in Scotland. Each video focuses on a different aspect of life in the coastal community of St Abbs – from the fishermen and dive boats who make a living from the sea – to the beautiful wildlife that live there. There’s so much science out there these days. In London, on any given day, there are dozens of science events, exhibitions, lectures and more. With so many insitutions pumping out so much great content, its difficult to find the events you really want to go to. 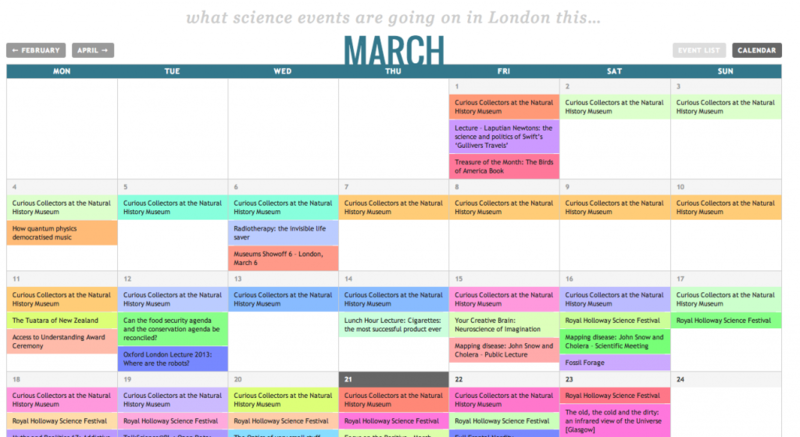 Here, at The Refinery, we’ve created a website that collates and organises all these events into a single website, to help you find the latest, interesting sciency-things going on in London.